My name is Leslie Callaway. My reason for starting this fundraiser is simple: Megan. She needs our help! 5 weeks ago, I called Jerry to come pick up my garage refrigerator that quit working months ago and it was time to get it hauled off. He explained that he couldn't because someone had rear ended his van and totaled it. Not that it was worth a lot, but it ran good and enabled him to drive around picking up scrap metal to help care for Megan's many needs. Jerry has a lot of contacts because a lot of people know he's doing this for her. 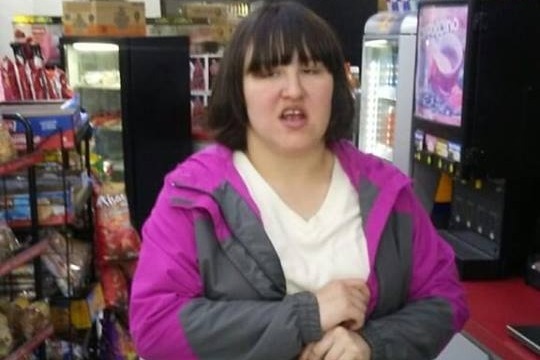 Megan is 22 years old and has Nonverbal Autism. Nonverbal Autism is a subset of Autism where the subject is unable to speak. While most children eventually begin to speak, there is a significant minority who will remain nonverbal. At 22 years old, Megan can only say 4 words, and those words are barely audible. She can say Maw Maw (her grandmother), Mommy, green and blue. 2 years ago, her Maw Maw passed away. When she was alive, she took care of Megan while Jerry worked at scrapping metal. Now Jerry has to take Megan with him everywhere he goes and she loves it. Jerry says it's the best thing that's happened for her because it helps stimulate her mind and she's doing much better because of it. Now, for the reason his hair is always messed up: Megan is riding in the backseat of my truck. They only way to communicate is with her body, hands, legs and of course attempted verbals sounds that are sometimes nerve racking for me, but Jerry is used to it and over time, I have become somewhat used to her actions. The first day I took them to pick up scrap metal, I hadn't put my seat belt on, yet. Megan started vocalizing loudly and reached up and grabbed her father by the hair and was shaking his head violently. The only way she knows how to get his attention when she's scared. Jerry told me to buckle up before putting my truck into drive. The last two weeks I have been taking Jerry and Megan almost every day to places all over the county to pick up AC units and more, then taking it to the scrap yard. While I don't mind helping, I cannot continue using my truck and utility trailer. I must go back to work for myself soon. So, Jerry needs a truck and trailer. Nothing fancy, just a good, dependable truck and of course a decent utility trailer. Megan can't help her condition and to strangers, she may appear to be in need of being institutionalized. Not the case! She is smart and also very sweet when treated with kindness. Five days into her riding around with me, she nearly brought me to tears. I was humbled instantly. The night before, I was wondering if anyone ever told her that she was pretty. Well, the next morning when she got in my truck, I said, "You sure do look pretty today, Megan". For the first time and the last, she made eye contact with me, smiled, took my hand, kissed it gently and said, "Maw Maw", then pointed to the cross I have hanging on my rear view mirror. She then sat back and started rocking back and forth like she always does. I guess her Maw Maw told her she was beautiful/pretty regularly. My heart breaks for this 22 year old and trapped in her limited world. Please watch the video of her daily routine and how hard her father works to make a little pocket money. If you've read this far, will you please take the time to share this page and make a small donation? Please and thank you from the bottom of my heart. All donations will go to buying a truck and trailer for her father, and if there's anything left, I will take her shopping for some pretty clothes and maybe a manicure and pedicure for her IF she can sit still long enough. This is what makes Megan happy...riding in my truck and seeing all her surroundings, which keeps her mind busy and lessons her anxiety.